This month's Birchbox is in honour of Breast Cancer Awareness Month and they have collaborated with Coppafeel. Coppafeel are a charity who aim to stamp out late detection of Breast Cancer and make people aware of the symptoms to look out for. 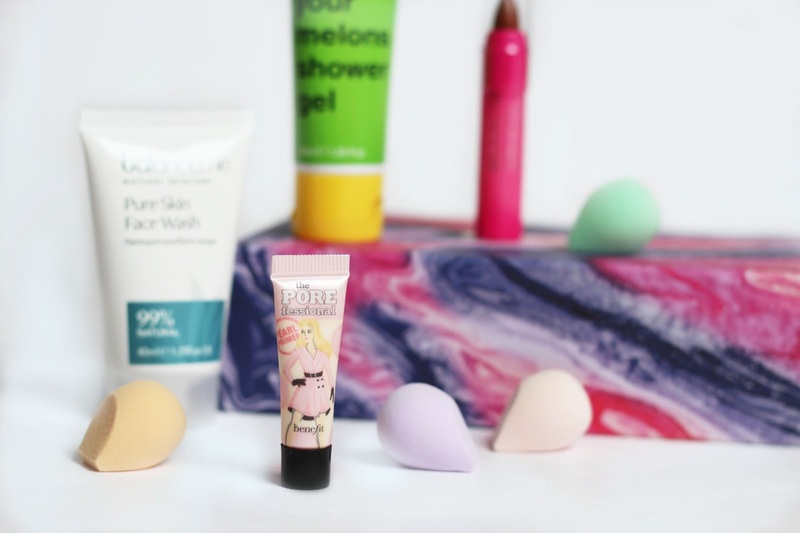 My favourite item in this month's box is the Benefit POREfessional Pearl Primer, this is a new product which is being launched soon. This new formula contains soft pearly pink pigment to make the complexion look brighter, smoother and more awake. I've been enjoying using this recently as it makes sure my foundation stay on much longer, not separate on my nose and keep a matte finish to my skin. In the box you also get the Eco Tools Mini Sponges, these are really handy for applying under eye concealer or blending cream highlight and contour. They're also shaped so they can fit in places like under the eyes to apply concealer and blend seamlessly. I love using cream contour and highlight, the ModelCo Contour Stick is a really handy product to apply because it's almost like a crayon. It's soft, so easy to blend in either with fingers or with a sponge to add definition to the face. The box also includes handy tips from Coppafeel on how to check yourself for signs of breast cancer and make people more aware which I think is brilliant!